A major new national opinion poll has found that 63 per cent of people in Ireland have witnessed poor provision of health and social care services, with nearly half (47%) having witnessed such poor standards in a public hospital. Carried out by Red C on behalf of HIQA, the survey found that of particular concern was the significant number of people who had witnessed physical or emotional abuse, including in homecare services. The poll also found that there was widespread misunderstanding of the areas of health and social care services that were independently regulated or monitored, with 83 per cent mistakenly believing private hospitals were regulated or monitored in this way, and 76 per cent believing that homecare services were independently scrutinised. The poll — carried out on HIQA’s 10th anniversary to help inform its future work, and released on Monday (May 8) — also found that there was strong support for respecting the rights of vulnerable people and for accountability and independent oversight of health and social care services, with 96 per cent agreeing that it was important that the rights of vulnerable people in long-term residential settings were respected. A vast majority (95%) also agreed that there ought to be clear accountability when provision of health and social care services feel below set standards, with 93 per cent agreeing that having independent oversight of health and social care services was important to ensure that they were safe and effective. Poor provision of public services was witnessed across a range of health and social care services in the past five years. It was found that 47 per cent of people witnessed poor provision in public hospitals, 21 per cent witnessed poor provision in homecare services and 21 per cent witnessed poor provision in nursing homes. Of those who witnessed poor provision in nursing homes, 36 per cent witnessed physical or emotional abuse. While for those who witnessed poor provision in homecare services, 24 per cent witnessed physical or emotional abuse. The poll found that there was widespread misunderstanding of which services were currently independently regulated or monitored. For example, when asked specifically whether services were independently regulated or monitored, 83 per cent believed that private hospitals were, 80 per cent believed that primary care centres were, and 76 per cent believed homecare services were. However, none of these services are currently independently regulated or monitored. 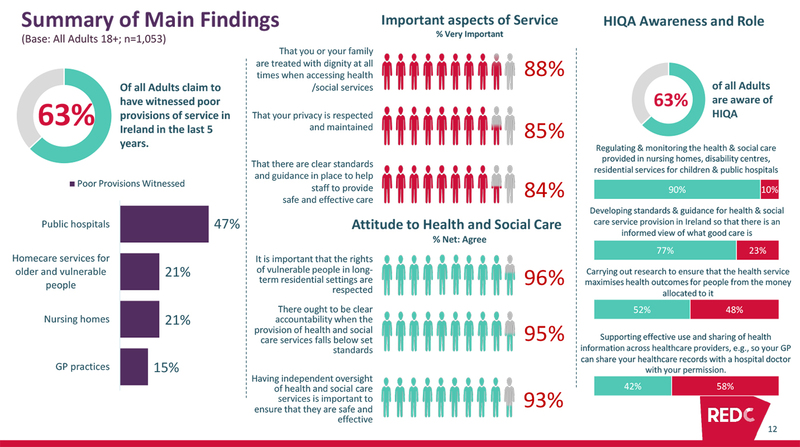 The aspects of service that the poll found were most important to ensuring good health and social care provision were that the individual and their family were treated with dignity at all times when accessing health and social services (88%), that their privacy was respected and maintained (85%) and that there were clear standards and guidance in place to help staff provide safe and effective care (84%). Strong support was seen for the independent regulation of a range of services, with the highest levels of support for homecare services (90%), public hospitals (90%), and community-based services for people with disabilities (88%). Of those polled — a random sample of 1,053 adults aged 18-plus interviewed online between February 23 and 28 — 63 per cent were aware of HIQA. However, there was stronger awareness of the Authority among over-65s (93%) than among 18- to 24-year-olds (36%). The aspect of HIQA’s work for which there was the strongest level of awareness was its regulatory role, with 57 per cent of the population aware of this function. HIQA’s Chief Executive Phelim Quinn commented: “As HIQA marks its 10th year, it is timely to look at the public’s attitudes towards health and social care in order to inform our future work driving better, safer care. “Unfortunately, it is still too common for the public to witness the poor provision of health and social care services. Many of the areas where poor provision is witnessed are currently not independently regulated. Commenting that the poll also showed “widespread misunderstanding” of which areas of health and social care were currently regulated and monitored, Quinn added: “Given the results, there may be some surprise among the public to discover that there is currently no independent regulation of private hospitals or homecare services. Indeed, the poll shows that when informed that these services are not independently regulated, there is widespread support for it to be introduced. The post 63% witness poor provision of services — HIQA appeared first on Irish Medical Times.